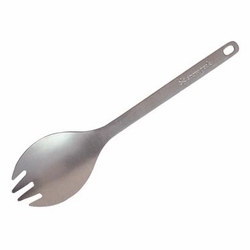 The world-famous Snow Peak Titanium Spork is extremely lightweight (0.6 oz), yet very durable and usable. Perfect for thru-hikers, backpackers, climbers and travelers. You can't go wrong with this one.